Jaisalmer and Jodhpur form an integral part of Rajasthan Tour Packages, This is one of the most sort after travel itinerary both with the foreigners as well as domestic Indian guests. Jaisalmer is situated on the north-western borders of the country. Glowing in the heart of the Thar Desert and stands incredible atop a hill in a dusty vastness of sun bleached sand. It was founded in 1156 A.D. by Rawal Jaisal a Bhatti Rajput king and named after him. The whole place is festooned with forts, palaces and temple. The beauty is etched in yellow sandstone lending it a golden aura. There people still continue to live in these ancient buildings dating from 12th to 15th century. Every house has exquisite carvings and filigreed work all over. Jaisalmer is rightly called museum city. Save new colonies, the entire Jaisalmer lies inside a city wall of 5 Kms length and is hence also called a walled city. It is also called a fort city. The sunset has a peculiar glow here. As the night descends slowly the sky goes up in flames., Which then fades leaving a few embers till it becomes coal black. Next to Chittorgarh,the fort of Jaisalmer is probably the oldest built by Rawal Jaisal in 1156 A.D. toward south of city on the hill Trikoot (the triple-peaked hill). 250 feet high from the the ground and has a fourth of population living here, 1500 feet in length and 750 feet in width, the base of foot is surrounded by 15 feet high wall of solid masonary. The wall of the fort encloses in it the old world charm, the old palaces, some Jain and Vaishnava temples, beautifully carved havelis, balconies. There are 99 bastions all along the wall which proved to be good assetls in war time. The huge guns and stones stored in these protected the fort against attacks. Princess Ratna is said to have fought against the army of Alauddin for 12 years. Jain Temples: Within the citadel are the splendrous Jain temples dedicated to Rishabb Devji and Sambhavnathji famous for their ancient architect dating back to 12th-15th century and details of gods and goddesses, dance scenes and mythological illustrations. Other famous Jain temples at Jaisalmer are Chandra Prabhuji, Parshwanathji and Mahavir Swamiji temple. Jin Bhadrasoori Gyan Bhandar: A libarary offering a gold-mine of ancient historical value. It has a rare collection of some of the oldest manuscripts found in India. Some 1126 of palm leaves and 2257 on paper, a few as old as 12th century. Established as a part of the Sambhavnathji Jain temple. The languages of Magadhi, Sanskrit, Prakrit, Aprabhansh, Brij etc. in the form of the work in these languages. Thus this Gyan Bhandar (Treasure of Knowledge) is probably one of the best in the country. Patwon Ki Haveli: The famous Patwa merchants of Jaisalmer utilized their wealths by building four colossus buildings of artful sculpture and architect in the 18th century. A five storey wonder, its ceiling is supported by handsomely carved and polished pillars. The screens carved out of slabs, several screened Balconies and attics, details in golden colour paintings and mosaics of glass and shells, all sence the visitor with the deep touch of skilful workmanship employed. Most influencive is the fine painting work which shows as if the building is actually built of one piece-stone. It is the most spectacular of all the beautiful mansions in Jaisalmer. Nathmalji Ki Haveli: Two architect brothers built Nath-malji-Ki-Haveli in the 19th century. One gave shape to the right and the other to the left and gave a truly remarkable result. The intricate symphony in stone touches the epitome of skill and beauty here. The interior walls are covered with paintings in the miniature style. Elephants carved of yellow sandstone are still guarding the haveli. Its delicate embroidery in stone is, a mark of perfection in the art of stone carving. Salim Singh-Ki-Haveli: A remarkable piece of architecture is built by Salim Singh the prime minister of the princely state of Jaisalmer. It is named after its builder. This unique carved yellow stone mansion is distinguished by its arched blue roof, supported by numerous brackets carved in the form of peacocks. Lodurva: 17 Kms, Amar Sagar: 5 Kms, Bada Bagh 6 Kms, Sam Sand Dunes : 42 Kms, Wood Fossil Park : 17 Kms, Desert National Park : 40 Kms, Kiradu 35 Kms. 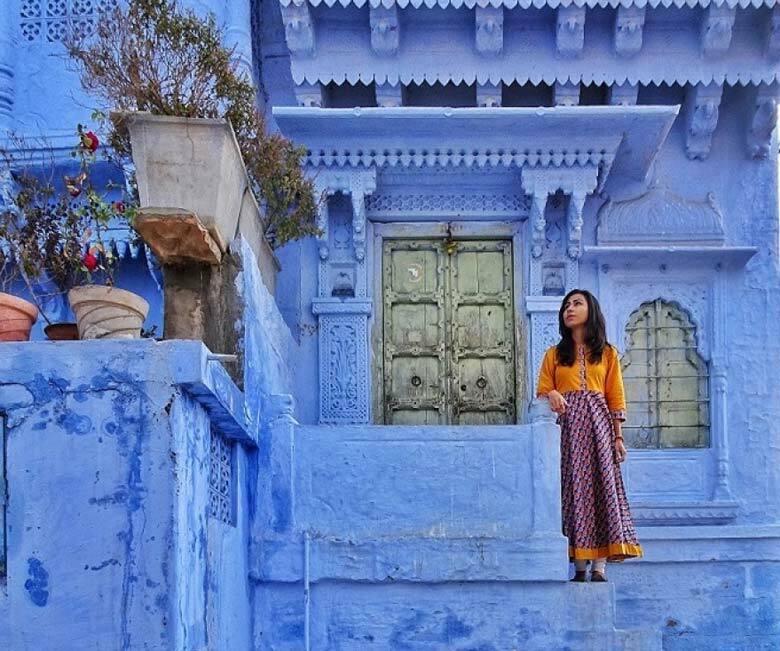 JODHPUR – A walled city habitation with seven gates at the foot of the citadel, studded with lakes and palaces and temples is Jodhpur Southern most of the desert cities, gateway to Thar desert. It is founded in the year 1459 by the Rathore chief Rao Jodhaji and called after him. This historic city lies in the Marwar country. The home of the Rathore rulers. Marwar or Maroodesh, the land of the sand was conquered by them after the fall of Delhi and Kanauj. Jodhpur till recently the capital of the state of Marwar. The wall is nearly 10 Krns in length and has seven gates facing various directions, within stands an imposing fort on a low range of sandstone hills, about 125 m. above the surrounding plains. The city lies at the foot of the hills. The clear distinction between the of and new city is visible from the ramparts. The Meherangarh fort: Meherangarh—means is a majestic and regal fort. Stands amid the city on a 490 ft high hill with a masonary wall, bearing several bastions surrounding it. The height of the wall varies from 20 ft to 120 feet chief of Jodhpur’s glories is this 15th century fort. It was founded in 1459 A.D. by Rao Jodha, when the ancient capital of Mandore was lost to the enemy. The Jaypol, Lohapol and Fatehpol are respectively the three entrance gates to the fort along with gradually rising road circumscribing the hill. Jaypol was built in 1809 by Maharaja Man Singh when he won over the forces of Jaipur and Bikaner against Jodhpur. Fatehpol (victory gate) was built in 1707 commemorates the victory of Maharaja Ajit Singh over the Mughals. The last gate is Loha-pole, began to build by Rao Maldeoji in the 16th century and completed by Maharaja Vijaya Singh ji in the 18th century. Inside the fort are a number of palaces added by successive rulers. The palaces them self are intricately adorned with long carved panels and latticed windows of exquisite designs in red sandstone. Moti Mahal built by Maharaja Sur Singh and Phool Mahal credited to Maharaja Abhaya Singh gorgeously painted in vivid colours. They have colourful mosaics on celings pillars and walls, and the Sheesh Mahal, Sileh Khana and Daulat Khana rich in their intriguing collections of palanquins, elephant howdahs, royal cradles, folk music instru-ments, costumes furniture and resplendent armoury. Chamunda temple is one of the rarest in India. A wonderful aerial view of the city can he observed from here either in glowing noonday desert sunlight or in the tantlizing evening light. Jaswant Thada: A white marble building, standing on a hill close to the fort is Jaswant Thada, A royal crematorium is built in 1899 A.D. in the memory of Maharaja Jaswant Singh II. This cenotaph preserves the royal geneology of the rulers of Jodhpur along with their portraits. There are four cenotaphs in marble. Built to commemorate the act of bravery and generosity of four successive rulers. Umaid Bhavan Palace or Chhitar Palace: This exquisite palace was built by Maharaja Umaid Singh in 1828-1848. It is aside the Chhitar lake and built of Makrana marble and red sandstone of Jodhpur on a hill. This majestic building of skilful proportions was designed by Sir H.C. Lancaster (President of Royal Institute of British Architects). It is better known as `Chhittar Palace’. There is an extensive garden with 40,000 sq feet lawn and a rose-collection of rare varieties. Today part of the palace has been converted into a hotel ( Taj Hotels and Resorts ) . But part of it still retains the royal ambience in all its glory and is open to visitor. Government museum has a rich collection of exhibits. Splendrous, armoury, textile, local art and crafts, miniature paintings, portraits of rulers, manuscripts and images of Jain Tirthankars, Museum is nestled in the middle of the Umaid Public Garden.It is a must see spot for every tourist. Mandore Gardens: 9 Kms North of Jodhpur is Mandore colloquial nickname for the ancient capital of Marwar `Manda-vyapur’ which was abandoned for strategic reasons, lies here in crumbling ruins. The old `Junagarh’ fort and a 4th century architect temple of Lord Krishna are in ruins also in ruins is the town. But today Mandore is famous for monstrous garden carved out of rocks indifferent terraces, various flowering and foliar herbs and shurbs with cool breezes caressing the structures all around. The another highlight of this place is the ‘Hall of Heroes’. It houses 16 gigantic figures, chiseled out of one single rock. Devals or royal cenotaphs were built, in the form of temples, in the memory of Maharaja Jaswant Singh and Maharaja Ajit Singh. Osian: An ancient town of the Thar desert is `Osian’ lies 65 Kms North—West of Jodhpur. Here lie 16 ruined Jain & Barhmanical temples dating from 5th-11th century. The most important of the temples are Surya and Sachiya Mata temple. The earlier temples are spectacular in their originality of com-position and sculptural elegance. Excursions From Jodhpur: Mahamandir: 2 Kms, Kailana lake: 11 Kms, BAL samand lake and palace: 7 Kms, Sardar Sarnand lake and Palace: 55 Kms, Dhawa wildlife Sanctuary: 45 Kms, Saila: 74 Kms. 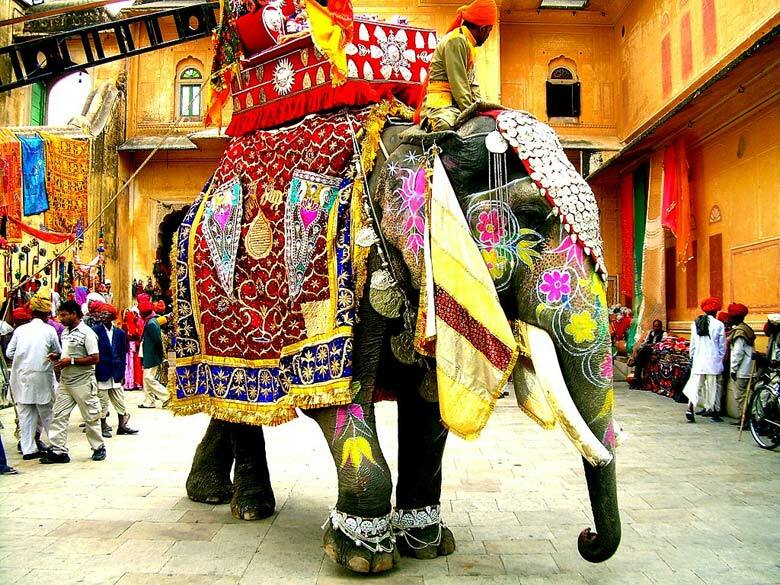 For more information on Jodhpur and Jaisalmer, contact a travel consultant at Swan Tours , One of the leading travel agents in India promoting Rajasthan Tourism since 1995.